Founded March 2010– Manteca, CA. non-profit organization Alliance of Therapy Dogs. 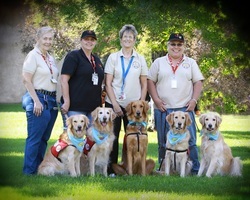 Manteca/Tracy area located in San Joaquin County in California, they found there were no organizations, clubs, groups or local support for therapy dog work. Four friends, Laura, Cheryl, Cathy and Nancy came together with the goal of forming a local therapy dog club. Their purpose was to share the love and joy of their canine companions. Paws 4 Friends includes a variety of people all with the goal of providing therapy dog services to their community. Each member brings his/her own abilities, talents and ideas that enhance their group. In building their club, the Paws 4 Friends Board and members have established important requirements and expectations that has resulted in a club with high standards. contributions and addresses concerns or questions that may arise. Members are all volunteers. It is the team work of the members that make these programs possible and successful. The Paws 4 Friends Club looks forward to continued growth in its membership and the development of new programs that will serve a need within our community. We are always looking for new ways to enhance our group and programs through suggestions from members, new members and the community. All of the members of Paws 4 Friends are volunteers. We are never paid for the visitations we make to the various facilites that we visit. Our work comes from the goodness of our hearts, doing what we love to do.